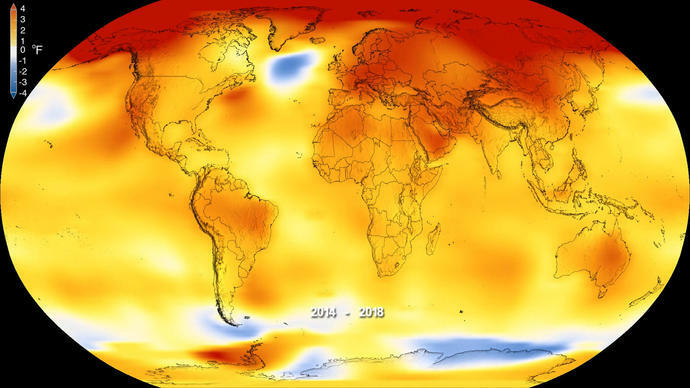 This map made available by NASA in February 2019 shows global surface temperature anomalies for 2014-2018. WASHINGTON (AP) - While 2018 was the fourth-warmest year on record, British meteorologists are predicting the next five years will be much hotter, maybe even record-breaking. The U.S. government's National Oceanic and Atmospheric Administration said 2018's average temperature was 58.42 degrees (14.69 Celsius), which is 1.42 degrees (0.79 Celsius) warmer than the 20th century average. Much of Europe had its warmest years on record. Records go back to 1880.